Bishop Edward B. Scharfenberger is honored by Students for Life on Wednesday. Standing with the Bishop, from left, Mary Fay, Tara Moser, Dennis Scharfenberger, Anna Scharfenberger and Renée Morgiewicz, Coordinator of Parish Services & Respect Life Ministry. Bishop Edward B. Scharfenberger celebrated his continuous fight for the pro-life cause at the Students for Life of America’s annual New York City gala, held April 10 at the Edison Ballroom in Manhattan. 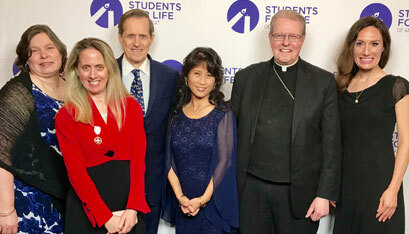 Bishop Scharfenberger was the recipient of this year’s Defender of Life Award from Students for Life, and provided the keynote speech at the gala. The Defender of Life Award is given to a pro-life hero in the community who has boldly and courageously fought for the lives of the unborn, and who has advanced the pro-life movement within their sphere of influence. Bishop Scharfenberger attended the gala alongside his brother, Dr. Dennis Scharfenberger, and his wife, Anna. In his acceptance speech, the Bishop spoke of the couple’s son and his nephew, Jon Scharfenberger, who died in a car crash in 2011. Scharfenberger, 22, was a well-known pro-life activist on his college campus, Ave Maria University in Naples, Fla. In his speech, Bishop Scharfenberger talked about how his nephew was an example in growing a culture of life. Jon Scharfenberger was president of his university’s Students for Life club, where he helped raise $30,000 for the group, as well as expand the club’s membership from 30 to more than 150 by his final year. After graduating, he became field director for the Students for Life campus group, as well as campus support coordinator and coordinator of the group’s Pregnant on Campus initiative. Much like his nephew’s work, which gave light and hope to countless lives, Bishop Scharfenberger has strived to promote the light and hope of the pro-life movement within the Diocese as well as across the state. This year, the Diocese launched Project Rachel, an initiative to help women and families struggling from the aftermath of an abortion; Bishop Scharfenberger attended the annual March for Life in Washington, D.C., and participated in the 40 Days for Life campaign in the Diocese. In 2018, Bishop Scharfenberger spoke to pro-life advocates at the New York State Capitol for the Lobby for Life Day. He also held a commissioning ceremony for 18 new parish respect life representatives across the Diocese during last year’s Respect Life Mass.